In the show, players had to select the top, middle or bottom screen to move forwards. Get a question wrong and they hit a "hot spot" (where they would lose all the cash they had won). Let's try a little game with your own swimming to do with how you enter and extend forwards at the front of the stroke. We'll call it "Top Middle or Bottom". This is bad technique as it adds a braking effect and it harms your catch on the water that follows. You will feel quite a lot of pressure on the palm of your hand (you might mistake this for a good catch) but it will slow you down dramatically and kill any rhythm in your stroke. To help you develop this position, put on a pair of fins and paddles (Finis Freestyler paddles are perfect for this) and swim 50m of freestyle, running through the "Top Middle and Bottom" positions. Too high and you hit a "hot spot" which adds drag and kills your stroke rhythm. Too low and your hand instantly dives downwards to the bottom - another hot-spot. But get in the right position in the middle ground and you develop a smooth rhythm and good propulsion. No hot-spot! Is this position lower than you might expect? It is for many swimmers. 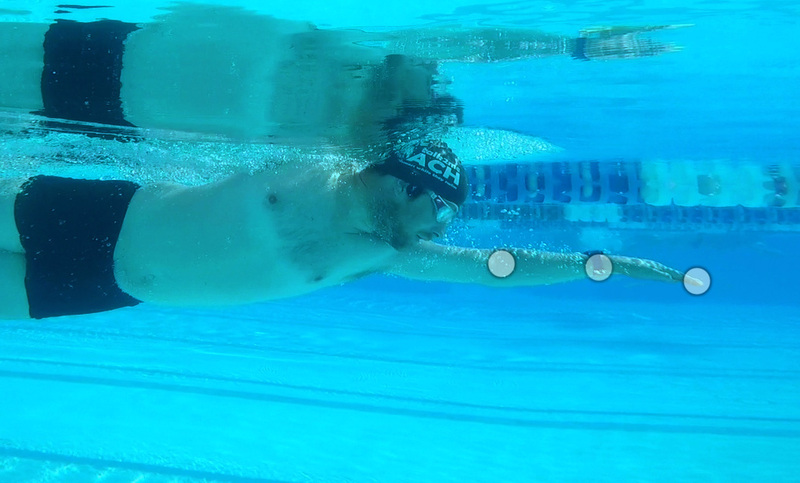 Transfer this good extension into your normal freestyle and you will instantly be faster through the water for the same effort, moving smoothly and continuously from one stroke to the next.